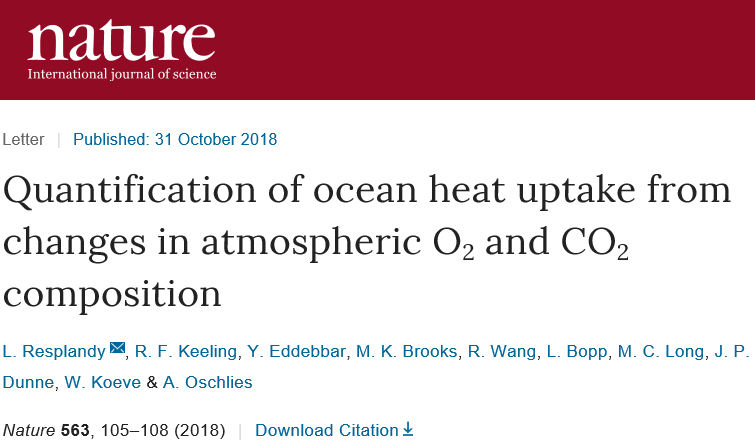 When a paper dealing with ocean heat absorption was found to have errors and in need of correction, the BBC reported it to the public. The German media, however, were perfectly content to leave its viewers and readers misinformed. Controversial paper was forced to be corrected. That’s how science works. A good example of how to deal professionally with a mistake. The BBC reported on the incident in a transparent manner. The German press, on the other hand, preferred to withdraw into its shell and conceal the incident. Resplandy and co, the errors were discovered almost immediately after publication. The corrections, not so fast.. The BBC many have corrected it’s statement but they did not give it any public prominence, so few members of the public realize this has happened. Thankfully many blogs (such as this one) have picked-up on this deliberate error and spread the word about the BBC’s willful inaccuracy in reporting on climate matters.